Norway’s national mint, Det Norske Myntverket, has sent out warnings that it must cut costs and, most likely, jobs. 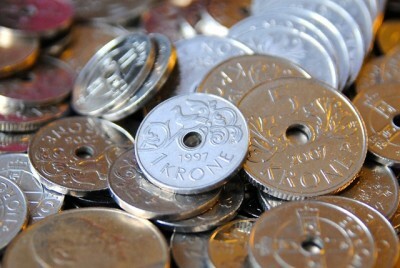 Fewer Norwegians are using cash, especially the coins that the mint has produced for centuries. Employees were called in to a meeting on Monday, at which they were told that the rising popularity of electronic payment systems may leave them out of work. Norwegian authorities have also actively been promoting electronic payment, not least the tax authorities that want to wipe out country’s underground economy. They want all payments to go through the country’s widespread electronic banking system, so that all transactions would be registered. A report compiled for national employers’ organization NHO last year concluded that cash transactions in the travel business now make up only 18 percent of the total, down from 40 percent just five years ago. Withdrawals from Norwegian minibanks (automated teller machines) have declined every year since 2007, with transactions in 2014 down 17 percent from the year before. While some officials are predicting that Norway will become a cashless society by the mid-2020s, others claim some form of cash will survive. The national mint in Kongsberg, home of the historic silver mines that once provided a key source of wealth and precious metal for coins, is nonetheless feeling the pinch. “Coin production for Norges Bank (Norway’s central bank) is falling rapidly, and the orders we’re getting are considerably fewer,” Kjell Wessel, mint master and chief executive of Myntverket, told Norwegian Broadcastig (NRK). Myntverket is one of the oldest businesses in Norway, founded in 1686. The company produces all Norwegian coins currently in circulation, and also produces the gold medal awarded as part of the annual Nobel Peace Prize. Wessel said there’s also been a decline in demand for medals made of precious metals. Norway has cut back on its production of commemorative coins as well. Employees at the mint are seriously concerned, especially since Kongsberg has been hit hard by job losses tied to the offshore and engineering industries. “It can be difficult to find another job in the market here now,” employees’ representative Espen Hægh told NRK. The mint’s board reportedly wants to eliminate nearly half the mint’s 16 full-time positions at present, to just nine. Sweden has already shut down its mint, and Denmark plans to cease coin production after New Year.